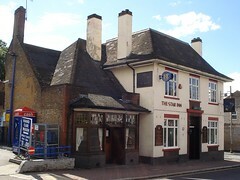 Note: According to the Aug/Sep 2015 London Drinker, since our last visit here the Star has undergone a change of tenant and a refurbishment (as well as a name change from the Star Inn). Hence, some of the information below may be out of date. This is very much an old-school pub, with traditional decor and retaining the old-fashioned division into separate bars. The left hand side still has "Saloon Lounge" printed on the door, and features wood-panelled walls, burgundy upholstery, a patterned carpet, padded banquettes, and fully frosted windows. The right hand side has a pool table and presumably corresponds to the old public bar. An internal door connects the two, but each also has its own entrance. Kake visited on a Saturday afternoon in September 2013. There were two real ales on: Sharp's Doom Bar (£1.60/half) and Courage Best. The Doom Bar was a little cloudy, and came out of the pump quite frothy, but the bar staff were careful to top up the glass after it had settled. There were four other customers in the saloon side; the other side was busier. No music was playing, but flatscreens on both sides of the pub were showing football with the sound on. A menu on the bar offered fairly standard pub food: sandwiches, things with chips, etc, though it wasn't clear what times this was available. Last visited by Kake, September 2013. Opening hours taken from the 2014 Good Beer Guide. Last edited 2015-09-12 14:11:01 (version 4; diff). List all versions. Page last edited 2015-09-12 14:11:01 (version 4).